I discovered this record completely by accident. One summer’s day, bored and waiting for a girlfriend to finish her holiday job, I dropped into Virgin Records. This, for those who haven’t heard of it is a huge record shop in central London. Virgin used to have a list of newly released and soon to be released records that people could browse through. Flicking through this to pass the time, Water’s Edge caught my eye and astonished me. I had assumed that the band had folded after the disappointment of Cut Above The Rest. To be honest, I bought Water’s Edge out of curiosity and for old time’s sake. Since it was not on display, this involved asking at the counter (I think this might have been because the official release date hadn’t arrived, which would make me one of the first people to hear Waters Edge). I remember the shop assistant managing to give the impression that ‘yes he had vaguely heard of Sweet, but wished he hadn’t’. To annoy him , I asked lots of questions which he had to find the answers to – ‘Yes it is new material’, yes we have it in stock ….’. The reason for mentioning this incident is that my unscientific sample of one, obviously wouldn’t be giving this album a listen! Water’s Edge was released at at time when surely alarms bells had been ringing hard for the band and even for the record company. The issue could not be ducked any longer, were the band capable of becoming relevant again as a major or even relatively minor force. The harsh fact is that Sweet in the UK were a forgotten entity. The even occasional press coverage even of the ‘Cut Above the Rest’ years had vaporised. Where once coverage had been hostile and unfair, times had changed – now the band was ignored. This period of the band’s career is a proof of Oscar Widle’s remark about there being no such thing as bad publicity. Water’s Edge was an attempt to respond to the situation, by swinging back to a more commercial sound. It’s not Poppa Joe, but seems to be the most out and out commercial album that the band had produced for years. One thing that surprised me then and still does is the number of tracks on the album written by other songwriters. What is even more significant is that the two tracks chosen as singles were not composed by the band. I have often wondered what was behind this, was it plain and simple lack of material, the record company throwing its weight around or a measure of desperation. Sweet had famously split from Chinn and Chapman to show they could write their own material, this seems like a backtrack. The inclusion of more catchy material then seems to be an attempt to get back into the public eye. At the time of release, the Sweet weren’t in fashion and it was unlikely that huge promotion would occur. Advertising by single was the only way forward. In the other reviews on this web site I have argued that this approach should have been adopted right back in the mid ’70s, and I still think it was their best bet at the time of Water’s Edge. But there must have been something wrong – unlike every other Sweet album, there is a feeling I get that the band is going through the motions. To me that is quite a serious charge for any band. Perhaps things were getting out of control off stage, perhaps their heart was no longer in it or maybe they didn’t like the musical style of Water’s Edge and had been forced into it. What you don’t get on this album is passion and enthusiasm. I don’t want to give the wrong impression, like all Sweet albums it has some good tracks and it worthwhile overall. For me though, it represents Sweet’s lowest point. If this had been the last album, you could have written it off as the band’s death throws, but the next album, Identity Crisis is much better and shows that there was nothing terminal in the band’s position at the time. So maybe it is just a poor album (relatively speaking). Like Cut above The Rest this album is more specific on songwriting credits than for Sweet’s earlier work. As mentioned above many of the tracks are not written by the band. Sixties Man (Williams Hutchins) This track was chosen as a single. It is catchy and could, given the breaks, have charted. The lyrics are tongue in cheek and predictably (given the title) are about a person who feels more comfortable with the ’60s than the ’80s. Steve does a good job on lead and it has a tight, polished sound. Apparently the single was due to be featured on a (cancelled) prime time TV show. Who knows if this appearance had happened, Sweet could easily have been back on the map. It isn’t one of my favourite Sweet singles as it happens, but it is a better song than many of the hit records from the same time by other artists. Unfortunately without promotion, it nose dived. Actually that probably isn’t true, it never took off in the first place! One thing that this shows is that it would take something special, luck and preferably some kind of PR album to re-establish the band. It may even be that the number of active fans at this stage (in the UK) was lower then than it is now. A lot of people now have rediscovered the band through the Internet. Then, most fans had lost touch with them and/or moved on. Getting in the Mood for Love (Scott, Priest, Tucker) Now in difference to the fact that this review is going to appear on a Sweet fan board, I thought about glossing over this track. But I decided (in the words of another ‘Water’s Edge’ track) to ‘Tell the truth’. It’s rubbish, actually can we make that bland rubbish? It sounds like the kind of background music you might hear in a hotel bar from their ‘guest musicians’. When I play Water’s Edge, I an always grateful that CDs allow you to skip over tracks. I always do on this one. Tell the Truth (Scott, Priest, Moberley) This is a much better track, it includes some classic Sweet harmonies and some keyboard work presumably by Gary Moberley. It does move dangerously close to musak at times, and always seems to run out of ideas slightly before the end, but it does just about hold up. Overall verdict? Respectable. Own Up (Scott, Priest, Tucker) This is actually a rework and slight rewrite of the ‘B’ side to teenage Rampage. My question is – why? On the one hand i always thought that the original worked less well than most of of the classic Sweet single’s ‘B’ sides, but the transformation doesn’t produce anything more than a fairly good album track. It also reinforces my impression that the band was scraping te barrel a little for material for this album. It is also interesting that the lyrics are rewritten, presumably so Brian couldn’t claim a songwriting credit. This seems a little cheap and in any case, I wouldn’t hold the new lyrics up as anything special.Too much talking (McReiner) This is a good song. For once I really like Andy’s voice on this and had one of the other songs actually released broken through as a single, this would have made a good follow up. I actually prefer it to ‘Sixties Man’. There are some magnificent harmonies on the song. 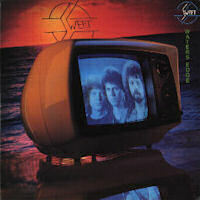 It shows the Sweet were still great performers even without Brian and on an album that overall is not one of their best. Thank you for Lovin Me (Scott, Moberley) The title of this song is similar in style to ‘Getting in the mood for Love’ and this is just as bad. Please refer to the GIMFL review and when playing Water’s Edge it is another skip track, I’m afraid. At Midnight (Scott) This is a good track- harks back slightly to a more traditional Sweet sound, but also is probably my personal favourite on the album. Again, unlike on earlier work, I like Andy’s voice and it is a tightly produced track. Waters Edge (Scott, Priest, Tucker) The album’s title track seems to be about someone emigrating. (perhaps inspired by Steve). I have heard somewhere that it is meant to be an angry song. I am not sure that it comes over that way particularly. It’s not bad though, not great, but OK. Hot Shot Gambler (Priest) Well I have already slammed two tracks from this album and here we go again! This is plain and simple rubbish – nothing musically and the lyrics are nothing more than a collection of clichés (I think the particular variety of cliché is meant to be American). I remember being outraged when I first heard it that Sweet should have considered this as being suitable for release. I still am. Being objective, I concede that some people may like this kind of music, I’m not one of them. Give the Lady Some Respect (McRiner) This is another single chosen from the album. i wasn’t keen on it on first hearing, but listening to it again, I do like it. As for Sixties man, it could easily have been a success chartwise. A good song. If you have followed my other Sweet album reviews on this site, you will have seen a lot of discussion on how te band’s style changed over the years. This album is no exception, having produced probably their most introspective album with Cut Above The Rest, they swung back to commercialism very strongly with this one. Whilst there are some good tracks on this (sadly often not the ones written by the band), there are a number of weak ones as well. It also seems to have a feeling of going through the motions in places. The number of tracks not composed by the band and the fact that overall the ones that are are so-so at best (except for ‘At Midnight’) make me wonder if song writing inspiration had dried up. (Note also the recycling of ‘Own Up’. At the time, I assumed it must have done.The next album ‘Identity Crisis’ shows that this wasn’t the case. More disturbingly, two songs that could easily have been successful sank without trace and made now progress in establishing the band. On the other hand, they were still great performers and given a few breaks, could still have rebroken through.Given where the band’s fortunes where when it was released, maybe ‘Water’s Edge’ didn’t do any additional damage, but in one way it was a wasted opportunity. When the next album was finished, no record company wanted to release it in the UK.